Posted February 4th, 2015 by & filed under Meeting. Pat Hill, of Pat Hill Landscape Design, Elgin, IL., co-founder and former president of Northern Kane County Wild Ones will take us?through the year, from March-early spring-through February-late winter-that shows one how to create long-blooming prairie and savanna gardens in ones own yard, no matter what the size. Pat moved into her Sears bungalow in the fall of 1997. 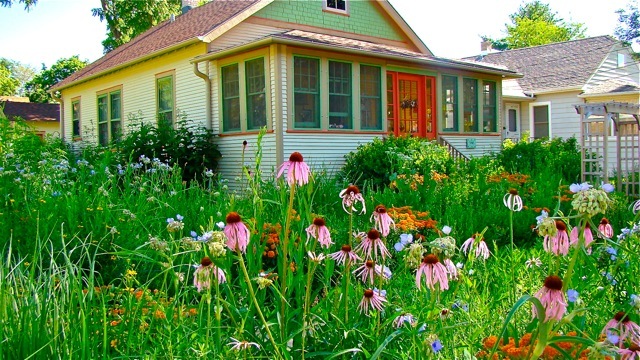 The following spring she began turning the 50’x 120′ city lot into prairie and savanna gardens. A Landscape Designer and winner of many awards, she has proven that one doesn’t have to own a country property in order to grow native plant gardens. ?Her gardens are a butterfly and bee haven from March through October. She is also the author of Design Your Natural Midwest Garden, published in 2007. Her book ?features 32 original native prairie and savanna garden designs in addition to 200+ photographs taken by the author. Her gardens have appeared in many publications including Better Homes and Gardens. Pat’s book will be for sale, personally autographed by the author. Come join Pat and Northern Kane County Wild Ones as she takes us on a garden journey through the year on 2/26/15 at 6:30 pm – 8:30. Details. Before Pat’s presentation, Kari Christensen is going to give a short presentation on ?Shared Harvest, the Elgin Food Cooperative. ?Cooperatives are for-profit enterprises that are created and exist to serve their owners needs. The founders of Shared Harvest saw a need for more access to good healthy food in Elgin and the area. Thus our cooperative vision is to create a full service grocery store in Elgin that is dedicated to providing year round access to healthy, sustainable, locally-produced food. Early investors are crucial as we build community support and equity to start our store. Each share is $100 and investor/members can buy up to 10 shares, but only one is needed to be a voting member of the cooperative. The Shared Harvest board has chosen a location and we are currently looking at build-out costs and seeking loans. Shared Harvest is one of about 10 food cooperative starting in Illinois at this time! For further information (or to buy shares) go to www.sharedharvest.coop or call Carol @847-873-9995.